With the recent increase of vehicles being used as weapons by terrorists, I feel it is appropriate to discuss how to stop a vehicle with gunfire. This primarily focuses on the use of a pistol as that is the weapon you are most likely to be carrying if you happen to run into someone using a vehicle as a weapon. If you’re lucky enough to have a rifle, these same suggestions will hold true, you’ll just be much more effective. How can you stop a vehicle that is being used as a weapon? The first step is to carry a firearm! I cannot stress this enough. If you can legally carry a firearm (either concealed or open carry) you should be carrying a firearm. With today’s worldwide assault on everyone by Islamic terrorists, it is imperative that every good guy carries a weapon. I’m sure my future articles will stress this too since I feel so strongly about it. The next thing you should do is realize that the vehicle is not the threat. The driver is the threat and the vehicle is only a weapon. If someone pulled a pistol and began firing at you, you wouldn’t intentionally shoot at the pistol, you would shoot at the gunman. The same goes for someone driving a vehicle. You need to engage the driver until they are no longer a threat. This means continuing to fire on them until they can no longer cause you (or anyone else) any harm. Neutralize the operator and you neutralize the threat. If you begin firing at the vehicle it will only waste rounds and rounds are one thing you cannot afford to waste. Shooting at tires will not stop the vehicle and shooting at the engine may eventually bring the vehicle to a stop but not nearly quick enough. Doesn’t shooting into a windshield cause the bullet to fragment or change the point of impact? A bonded hollow point will hold up to a windshield better than a non-bonded hollow point, but there is no ideal bullet to use when firing through windshield glass. The laminated glass of a windshield is a lot stronger than other glass and is likely to deform or damage most rounds. When engaging a threat through the windshield, your rounds will tend to hit lower than where you are aiming. The best thing you can do is to continue to fire until the driver is no longer a threat. Aim at the driver and shoot. Some of your rounds will find their mark. Lehigh Defense makes the Xtreme Defense and Xtreme Penetration round. They are a solid copper round with a cross-shaped tip. The bullet design gives it good penetration capabilities and allows it to create a wound channel similar to a traditional hollow point. They could be an interesting choice as a carry ammo given today’s threats. 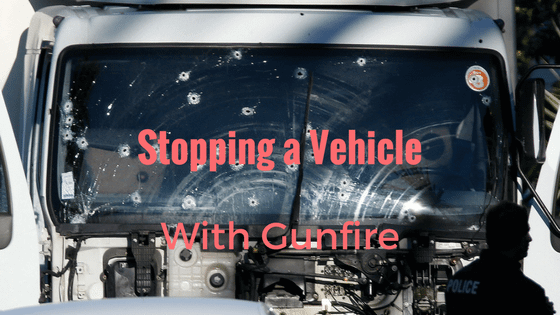 Stopping a vehicle with gunfire is difficult but it can be done! You can find more defense articles right here. Regarding shooting at the tires, a friend of mine had his vehicle stolen from in front of his place of employment He saw the thieves get in his truck. He ran outside. He had a CCW. He drew his pistol and the crooks drove the truck at him. He jumped out of the way and shot out a tire. They continue on. He borrowed a car and chased them clear across town with one tire flat before he lost them. Almost nightly on TV there is a stolen car chase. Frequently one or more tires on the car being chased have been flattened either because the thief drove over some junk or the police used a puncture strip. I can’t tell how many chases I have seen on TV with the car trailing a rooster tail of sparks from the flattened wheel. Sometimes they drive for many miles with one or more wheels flat. Flat tires don’t do a thing to stop a car. Don’t even slow it down. Shooting the driver is the only sure method of stopping a car. You definitely need to engage the driver. Anything less and you’re not going to be effective.